Magnificent Seven on the Marsh! Unique seven-bedroom marsh front custom home offers both ocean and ICW views. Every bedroom has its own TV and en suite bathroom, and that’s just the tip of the sand dune! The home is constructed with architectural and design details to create a vacation retreat you will book year after year. Interior highlights include a dream kitchen with two refrigerators and dishwashers, a large apron front sink, and ample preparation space on beautiful honed granite. 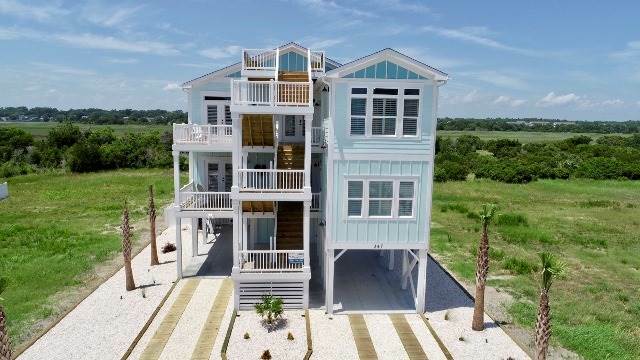 There are two living rooms with floor-to-ceiling windows to capture marshland and ICW views, plus spectacular ocean views from the second floor and widows walk. The top floor living room has a vaulted ceiling, and a gas fireplace with a custom mantel surround, built-in cabinets and shiplap that complements the home’s coastal farmhouse décor. Accessories bring personality to the soothing neutral palette. Special millwork blends the best of time-honored craftsmanship with today’s lifestyle. There are hardwood floors in living and bedroom areas, and custom tile bathrooms with granite or quartz counters. The two living rooms have large TVs, and every room has a USB port. One bedroom/bathroom is wheelchair accessible. The home has a three-stop elevator. An oversized lot allows for the best in outdoor living. There is a 40' x 16' private pool (truly private backyard - no house can be built behind it), a tiki bar, and 1300 square feet of covered decks on two levels. Decks are connected by outside staircases, which eliminate traipsing through the house to get from the pool to the top floor kitchen or from one deck to another. Beach access is only 150 yards away – wash off the sand in the outdoor shower before enjoying lunch at the picnic table. The house sleeps 20: 4 king-bedded rooms; 1 room with two doubles; one with a double and twin with a trundle, and one bunk room with 4 built in bunks. See complete list of amenities below. All beds are made prior to arrival, bath and kitchen towels are provided. Words cannot describe the house. The owners anticipated every need and it is so comfortable. The location is excellent with views of the Intercostal and the ocean and an easy walk to the beach. Everyone had a wonderful time. Great value with all amenities.